This re-badged Franka 125 but lack metering seen it's sister models. The film speed reminder on the rewind nob is notable in that it goes up to 3200asa although the display space is too small so 1600 and 3200 are displayed as 160 and 320. 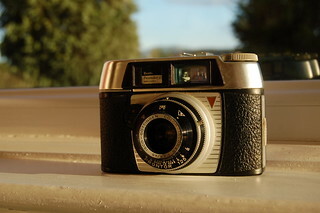 This camera is a rebadged Franka 125 L. Mechanically the same as the Pacemaker 35 but features an uncoupled selenium light meter which produced a value (1-10) on the upper lens casing. Using this and the film speed on an adjacent dial calculator gives shutter and aperture speed combinations. This metered model is again based on one of the King Regula Sprinty series, and was a copy of their Regula Sprintic model C. Like the Pacemaker LM & LP it features an uncoupled light meter built into the top panel, plus a flash cube holder mounted directly above the lens. The light meter scale is read as a combination of apertures and shutter speeds, and the exposure settings round the lens barrel are arranged in the same groups. So, at the bottom end of the scale it’s possible to select 1/30th and f/2.8, and at the top the camera offers 1/300th at f/16 with groups of other combinations in-between. Focus is completely manual, with distances marked in both feet, meters, and icons for Landscape, Group and Portraits.